Evo & Grace: The WanderLusts: Nick Joaquin’s Fathers and Sons/Mga Ama, Mga Anak. Nick Joaquin’s Fathers and Sons/Mga Ama, Mga Anak. National Artist Nick Joaquin is one of our writers whose works have been reproduced in different genres numerous times. 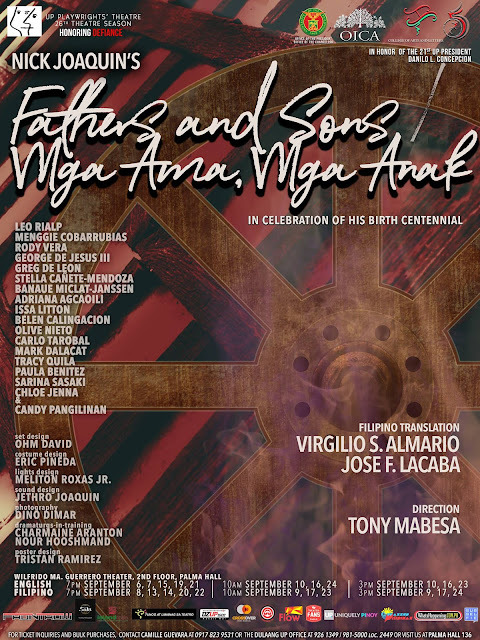 In celebration of his birth centennial, UP Playwrights’ Theatre stages “Fathers and Sons” in English and Filipino (“Mga Ama, Mga Anak” translated by Virgilio S. Almario and Jose F. Lacaba). This is based on Joaquin’s short story “Three Generations”. 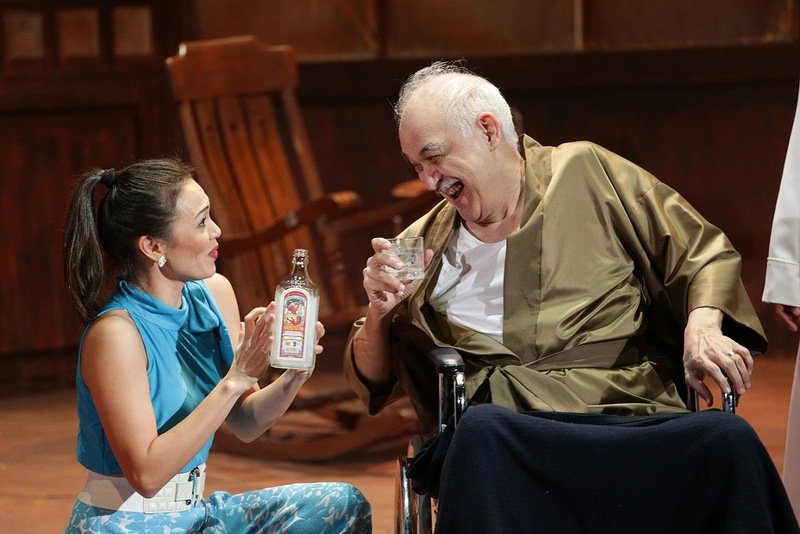 Directed by theatre veteran Tony Mabesa, the three-act play Mga Ama, Mga Anak tells the story of an ailing patriarch and the effects of his supremacy in his household. Set in the 70s, Zacarias Monzon reminisces his glorious past as the Caritela King while his family delves into their issues caused by his power. There is his spinster daughter Nena who took care of him all her life. More conflict ensues with his rich son Celo who have always questioned his father’s morality. And speaking of morality, Bessie, a former go go dancer, is the current flame of Zacarias. These characters narrate their struggles of identity and resistance. When re-staging a classic play as it is, we should expect the strength coming from the actors. With the powerhouse cast led by veteran actors, UPPT’s “Fathers and Sons” displays an array of talents. Leo Rialp and Menggie Cobarrubias play Zacarias. Banaue Miclat-Janssen and Stella Canete-Mendoza alternates for Nena. Issa Litton plays Sofia, the wife of Celo, lightens the angry mood of the show. Nick Joaquin’s works has inspired stories of today. Reminiscent of family teleseryes, Fathers and Sons is full of metaphors of power and sexism. Zacarias’ whip as a symbol of tyranny, the huge table for his patriarchy. Zacarias never seem to recognize any of the female characters whenever they talk to him. This symbolizes the dominance of males in our society. Fathers and Sons/Mga Ama, Mga Anak will be at Wilfrido Ma. Guerrero Theater at UP Diliman until September 24.